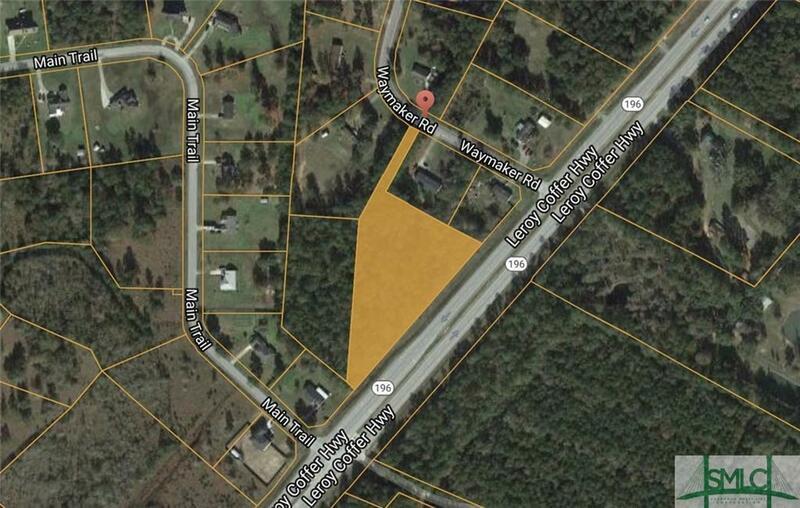 Commercial or multiple uses of 2.99 acre lot located on Hwy 196 in Midway. Can be sold with Leroy Coffer Road property 2.0 acre, total of 5 acres. Site offers 579 feet of footage along Hwy 196. Daily traffic count is over 14,400 vehicles a day.Commercial or residential development site off Leroy Coffer Highway 196. This 2.99 acre lot can be re-zoned for commercial use, making a great space for a convenience store with gas station fast food restaurants, stand alone building with parking lot, or small residential neighborhood. It sits in a convenient location, not far from either Oglethorpe Hwy into Hinesville & Fort Stewart, & Hwy 17 so you can easily travel to Richmond Hill into Savannah within 20 minutes. Not to forget, extremely busy I-95 (50,000 + vpd) is not very far.